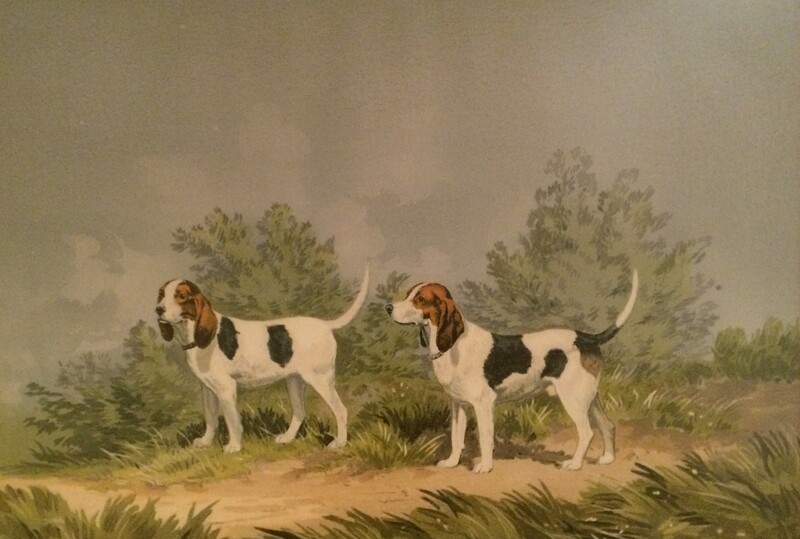 Towards the latter half of the 19th century, the popularity of purebred dog paintings was at an all time high. Newly acquired pets by society were all the rage and many artists were commissioned to capture their likeness in oil on canvas. These purebred dogs, mostly imported from England, not only were comforting to the women of the house, but greeted the men returning from work with a wagging tail. Americans were following this “pet craze” as it was the fashion in Victorian England. Queen Victoria, an avid dog fancier, was especially fond of Pomeranians. Many in Great Britain and in the States emulated her by having pets of their own. 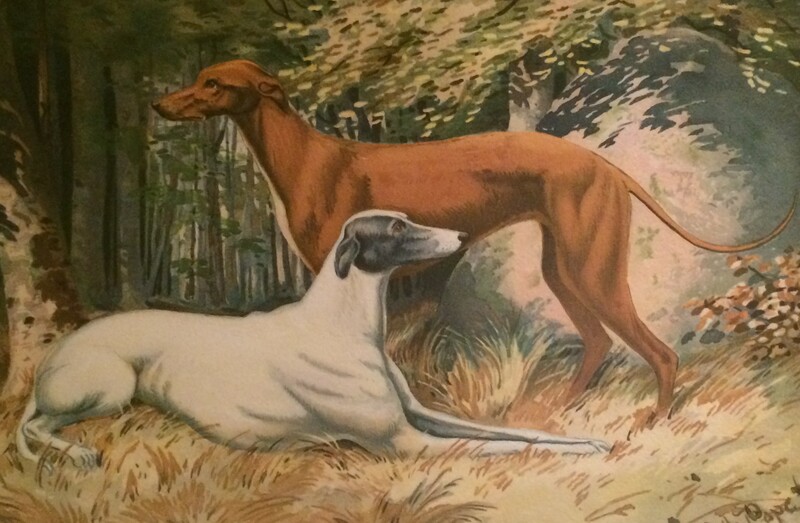 Paintings of royal dogs, sporting dogs, hunting dogs and pet dogs across all breeds were in abundance in the grand estates and city townhouses of the Gilded Age. At the same time, field trials were gaining in popularity with many hunting dogs being imported from England to compete in the U.S. in both field trials and the newer sport of dog shows. These hunting and show dogs became celebrities in their own right. George Earl, an English painter known for his depictions of sporting dogs, came from sporting families in Worcestershire and Gloucestershire. An early member of The Kennel Club in England, he had two exhibitions at the Royal Academy in 1857 and 1882. His most important work “The Field Trial Meeting” was a compilation of the most famous sporting dogs and their handlers of the ear in a fantasy field trial on a Northern Welsh landscape. 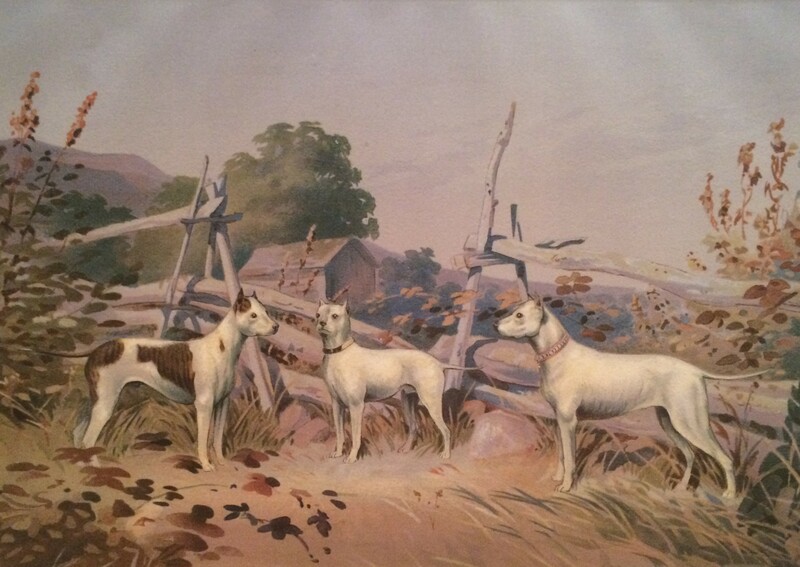 Earl’s other notable work, “Champion Dogs of England,” was painted in the 1870s. 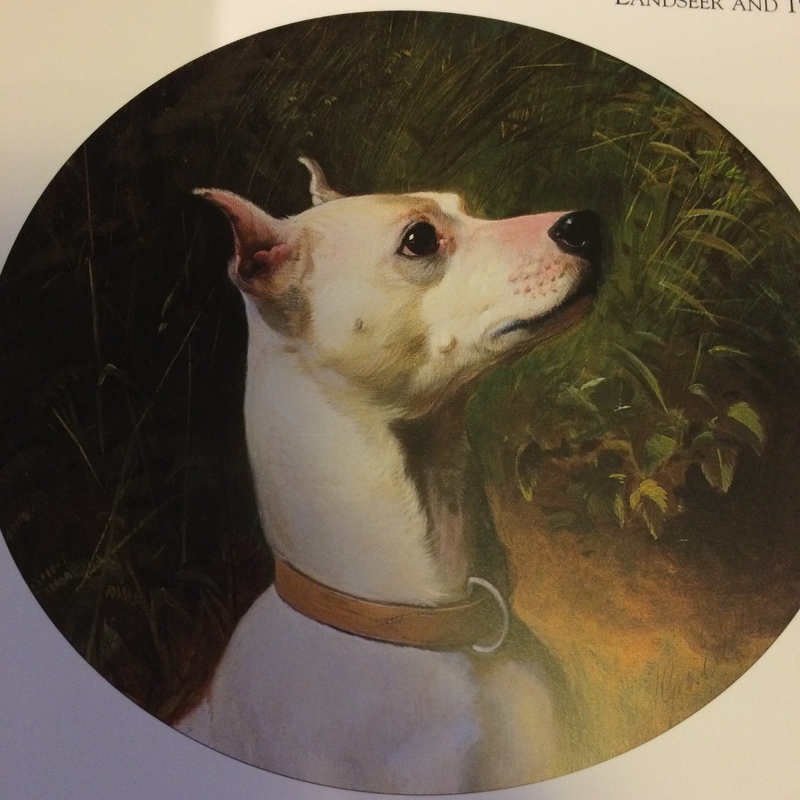 This series of 24 purebred dogs were portrait head studies painted in a circle or oval design. They included such famous dogs as Warrior, a Scottish Deerhound. He was one of the most prominent Deerhounds of the 19th Century. Sir Walter Scott is credited with promoting the breed to the masses. He wrote about them in his novels and kept them at Abbotsford, his estate in the Scottish Highlands. Others portraits in the series were Rake, the Irish Water Spaniel, Cato, the Newfoundland and Prince, the White English Terrier. The White English Terrier, a ratter with cropped ears, hailed from Birmingham and Manchester eventually working its way down to London through promotion by Fredrick White. By the end of the 19th Century dogs with cropped ears were barred from dog shows in England and this little white breed fell out of favor among fanciers. By 1906, there were no White English Terriers to be found at any dog shows and soon after the breed went extinct. But not before one handsome male, Prince, made his way to the new world. 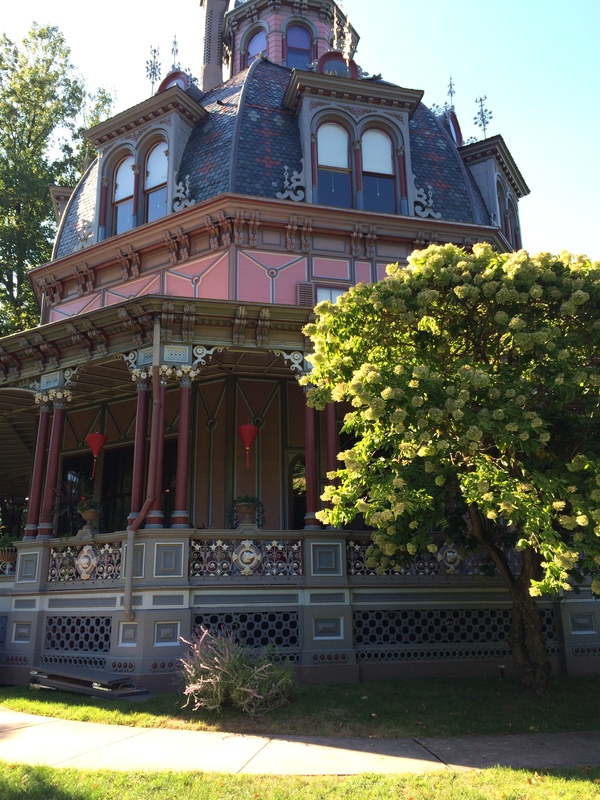 When I first visited the Octagon House many years ago and heard the story of Prince and the breed’s extinction, a deja vu feeling came over me. The verandah head study is in profile, facing right, wearing a small leather collar with Prince inscribed on it. 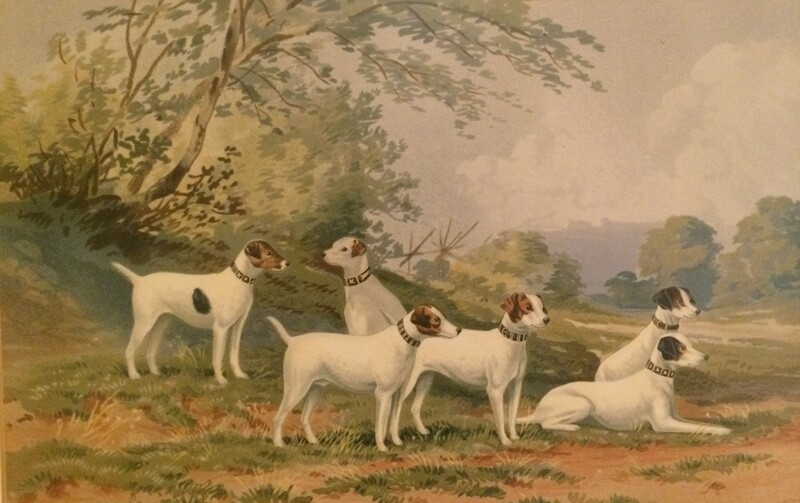 When I went to work at the American Kennel Club the next day, I came upon an oval painting, of a little White English Terrier named Prince, in profile, facing right, hanging in the Chairman’s office. Bingo! 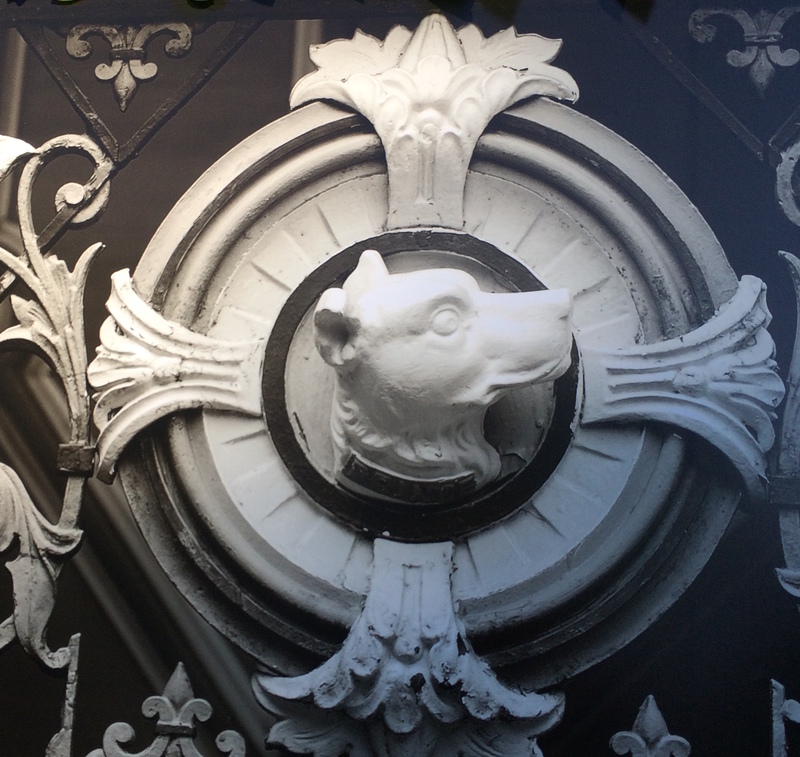 I was looking at the very same “Prince,” one of George Earl’s series of dog portraits from “Champion Dogs of England.” Looking at that painting, you couldn’t help but think it was used as the model for the iron cast heads on the verandah of the Octagon House. 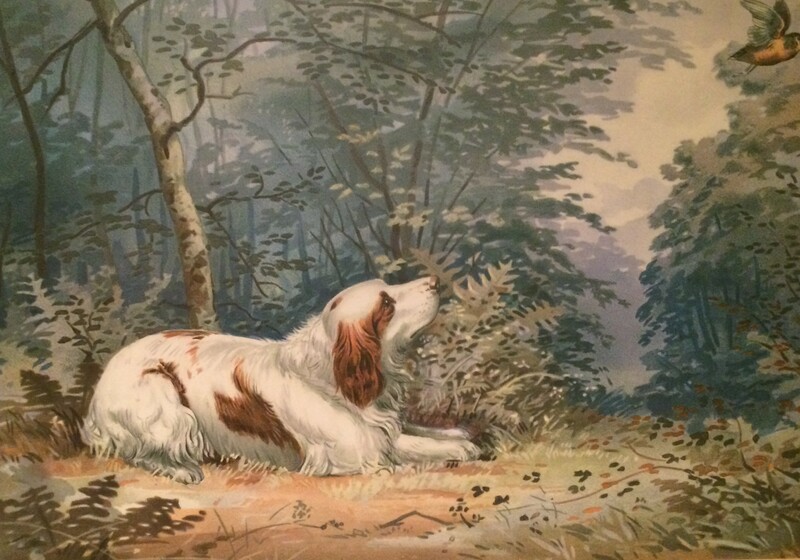 It is possible that Joseph Stiner may have owned that George Earl oil painting of his beloved dog at one time? I can only speculate, but it is known that Prince was a show dog and exhibited at the Westminster Kennel Club. Based on my research, Prince most likely arrived from England after 1872 and before the First Annual New York Bench Show, held by the Westminster Kennel Club in 1877. At that time his portrait, most likely, had already been painted in England by George Earl. This top winning British show dog eventually joined 1,201 other purebred dogs at one of the first dog shows in America at the Hippodrome at Gilmore’s Garden. But like all dogs, his biggest achievement was to greet his owner Joseph Stiner with a wagging tail. While binge-watching Ken Burn’s historic PBS series The Roosevelts last week, a photo of Theodore Roosevelt and his hunting dogs triggered a thought; there is a meeting room in my office called the Roosevelt Room. 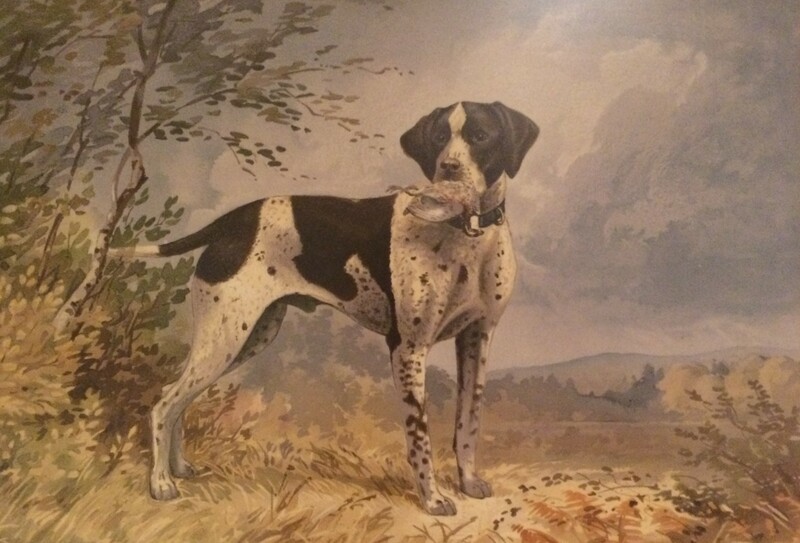 I knew the collection of sporting dog prints and detailed pedigrees that graced the walls had something to do with “Teddy” but after a decade of sitting through countless meetings starring at these prints, their origins had been lost on me. So I took a recent lunch break to revisit the treasures of the Roosevelt Room at the American Kennel Club headquarters in Manhattan. As part of 19th century gentlemen’s society, Teddy must have not only studied, but hunted with these sporting purebred dogs. Today, the 18 muted chromolithographs of original watercolors painted by wildlife painter Alexander Pope, Jr. (1849-1924) hang in a neat row, midway up the walls, circling the room, except where their flow is interrupted by an HDTV used for video conferencing. Trimbush, a Clumber Spaniel, whelped May 1875, had quite the pedigree. “Trimbush was bred by Mr. William Brailsford, head keeper to the Duke of Westminster, and was imported by Mr. Jonathan Tomas, jr., of New York. He is a perfect specimen of the breed and his superior could not be found in England at the time he was brought to this country.” Trimbush’s mother was Earl Spencer’s Sall, out of Earl Spencer’s Meg and Marquis of Exeter’s Beau, Beau’s sire being the Duke of Newcastle’s Rover. It seems that big fancy names were not the rage back then. Take for example others in the collection, champion Red Irish Setters Elcho & Rose, Don the smooth-coated St. Bernard, Mike, the imported Irish Water Spaniel, Lofty the Llewellyn Setter Dog, Jack, the English Mastiff, and the white Bull Terriers, Spider, Grabb and Nellie, whose likenesses silhouetted against farm fencing made a pretty picture. Rattler and Belle, two Beagles, owned by J.M. Dodge of Detroit came with this explanation. “Foot beagles should not much exceed nine inches in height; they are now even used up to eleven and twelve inches, going a pace which requires a good runner, in prime condition, to keep up with them.” Did Teddy ever had to keep up with these quick Beagles as they chased hares across the countryside. I wonder which dog was Teddy’s favorite? If you’d like to view the collection, drop me a line, it’s open for public viewing by appointment.